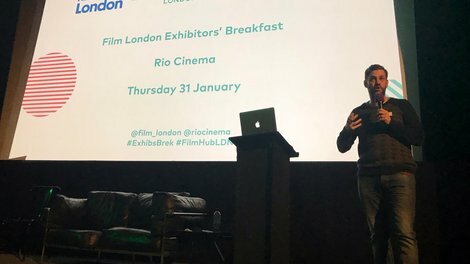 Last week, Film London headed to Rio Cinema to present the latest Exhibitors’ Breakfast - a morning of networking and discussion for distributors and exhibitors, with this edition based primarily on funding strategies and crowdfunding schemes. Attendees were presented with a series of successful crowdfunding case studies from Rio Cinema’s Oliver Meek, Lexi Cinema’s Rosie Greatorex and The Castle Cinema’s Asher Charman. Each speaker presented their own experience with the crowdfunding model and their strategies for achieving success, before coming together on stage for a panel discussion and Q&A with Film Hub London members. The event closed with Carina Volkes, Film Culture Coordinator at Film London, who highlighted the various funds and schemes available at Film London to support exhibitors and distributors, which include our Exhibitor Activation Programme, and the BFI FAN Screen Heritage Programme. The Exhibitors’ Breakfasts are an excellent opportunity for Film Hub London members to meet, network, share best practice and explore ways in which they can work together to boost audiences, broaden their reach and engage diverse new audiences. If you’d like to get involved or find out more, you can contact the Film Hub team here, or read about the membership process here.